Leading Worship – You CAN make a Joyful Noise! Leading Worship - You CAN make a Joyful Noise! One of the preconceptions out there is that in order to lead worship you need to be a premier musician. 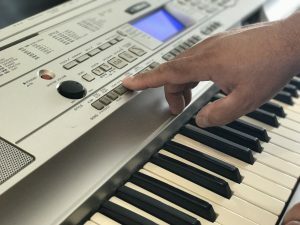 No question, having a general knowledge of how to play an instrument can certainly help, but it's certainly not required for leading worship or to be a profitable worship leader for the Lord. All you need is a heart to and a desire to server the Lord and His People through worship. There are many tools out there these days that can make is very, very easy for anyone willing to put in a little effort to not only play the basics, but actually fill the room with music and help with leading worship. One of my close friend is Brad Capshaw, part of our fellowship in South Carolina. He lost his left arm in an automobile accident many years ago. He had previously been a bass player. As a guitarist, loosing my left arm would be tragic. As the Lord was developing a fellowship in South Carolina I decided one day to take Brad and travel to Guitar Center and buy some gear. I got a Yamaha keyboard, keyboard amp, electric guitar and guitar amp. Within a very short period of time Brad was up and going on the Keyboard and able to contribute and really round out the music team for the South Carolina Fellowship. He's only got one arm, but was able to jump right in, and with some work, be very proficient. Yamaha DGX series. The DGX500, which was a very early model digital grand piano, has various sounds, rhythms, and auto accompaniment arrangements with a very easy one finger chord system that can let anyone jump in and play some great music unto the Lord. Yamaha PSR Series. The PRS series from Yamaha has a very rich heritage. I started on the PSR 90 back in 1989. If you can find a PSR 740, PSR 3000, PSR s700, PSR S710, PSR s900, PSR S910, or any of the newer PSR series, you'll have an incredibly flexible instrument to work with. Even an older PSR 530 would be a great start. The beauty of the Yamaha line of instruments is that they all work the same. I'm probably going to start the first videos using the DGX 500 as it's generally easy to find for around $200 (used at Guitar Center is a great place to look) and sounds great. If you have any questions or would like to contact me for some help getting started, please send me an email via our contact us page.